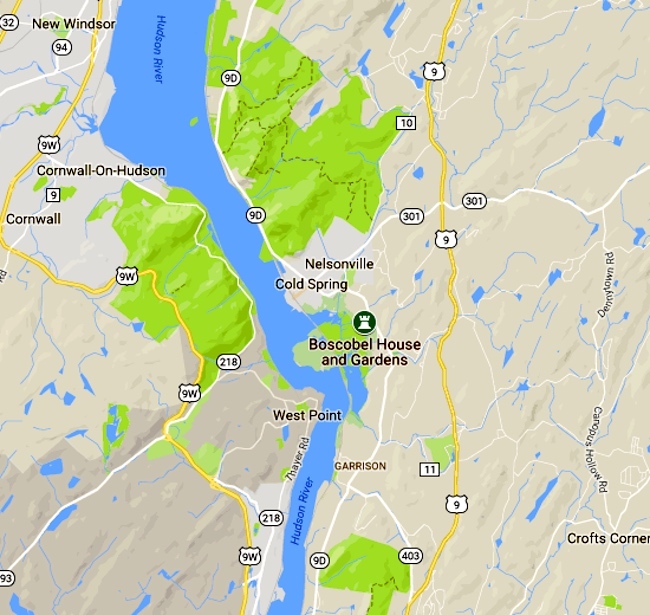 Beautiful natural vistas, drama, and history come together at Boscobel House and Gardens, home of the Hudson Valley Shakespeare Festival, about ninety minutes north of the city. Exciting unplanned confluences, such as a convoy of helicopters flying over “Macbeth,” occur regularly [thus making a virtue out of inconvenience]. “A Week of Revolution” (Aug. 27-Sept. 4) will include reënactments, picnics, hikes, and a staging of Richard Nelson’s play “The General from America,” about Benedict Arnold, who tried to hand his command of West Point — visible across the river — over to the British. An intriguing program, but what caught my eye was the name Boscobel for the house and estate. Long familiar to me, but seen in a new light after two Bosco postings on this blog: from the 20th, on Bosco chocolate syrup and the 25th, on Don Bosco (St. Giovanni / John Bosco). Eventually this will lead us to Miltonian bosky dells and dogs named Bosco (one of whom got elected mayor of Sunol CA some years ago). Bosco Name Meaning. Italian: topographic name for someone living or working in a wood, from Late Latin boscus ‘shrub’, ‘undergrowth’ (of Gallic or Germanic origin), or a habitational name from a place named with this word. [Compare the English surnames Forest, Wood, Woods, Bush.] De Felice suggests that in some cases it may have been an occupational name for a woodsman or forester and, by extension, a nickname for a surly or rough person. adj bosky wooded; covered by trees or bushes: a river meandering between bosky banks. ORIGIN late 16th century: from Middle English bosk, variant of bush. OED2’s story on bosk has it related to bush — but it entertains the possibility that “the modern literary word may have evolved < bosky” — and has it attested in the sense ‘bush’ in ME. The ‘bush’ sense went obsolete, and in the 19th century bosk reappeared as a literary word, now in the sense ‘a thicket of bushes and underwood; a small wood’. So in the Italian noun bosco and adj boscoso and in the English noun bosk and adjective bosky, we have a, um, lexical thicket involving two (obviously related) clusters of meanings ‘bush, shrub, undergrowth’ and ‘a wood, woods, wooded area’, moving in some complex way between Germanic and Late Latin. [In the early 19th century:] With the interest on a sizable annuity granted him by Sir William Erskine, [States] Dyckman intended to build an estate on 250 acres near Montrose and named it Boscobel, perhaps after Boscobel House in Shropshire (itself named for the Italianate charm of Bosco Bello, “pretty woodland”), symbolizing his Anglophilia. Boscobel is an estate overlooking the Hudson River built in the early 19th century by States Dyckman. It is considered an outstanding example of the Federal style of American architecture, augmented by Dyckman’s extensive collection of period decorations and furniture. Today it is a historic house museum and popular tourist attraction. 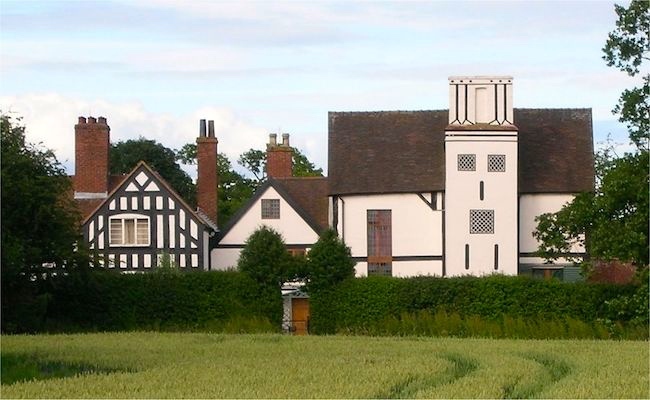 Boscobel House is a … building in the parish of Boscobel in Shropshire. 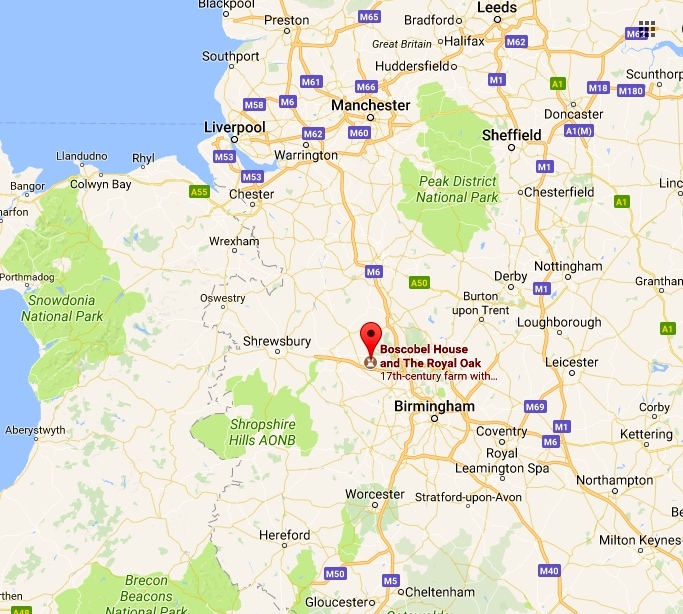 It has been, at various times, a farmhouse, a hunting lodge, and a holiday home; but it is most famous for its role in the escape of Charles II after the Battle of Worcester in 1651. Today it is managed by English Heritage. Both houses lie in beautiful woodland, bosco bello. With its breathtaking views of the Hudson River, Boscobel provides the perfect setting for the Hudson Valley Shakespeare Festival’s 30th Anniversary summer season. For three decades HVSF has brought world-class performance to the Hudson Highlands as the only professional Shakespeare company in the region. 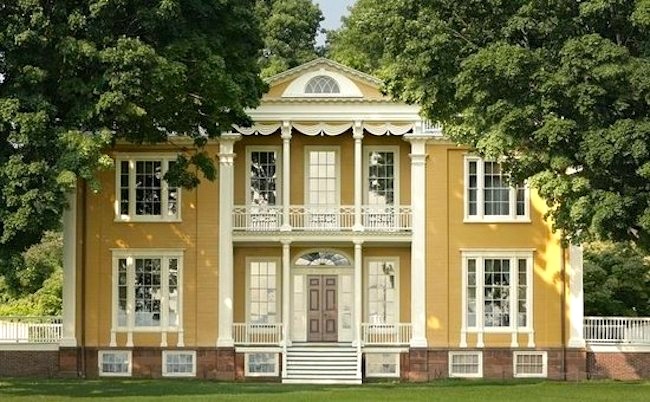 HVSF has established a reputation for lucid, imaginative, engaging and highly inventive productions staged on Boscobel’s historic Great Lawn with a backdrop of stunning vistas overlooking the Hudson River. The Festival’s productions, tours and education programs reach more than 90,000 people throughout the tri-state region each year. Boscobel’s magnificent grounds open two hours before the show (5:30pm) for pre-theater picnicking. Bring your own picnic or enjoy prepared foods available for purchase on site. 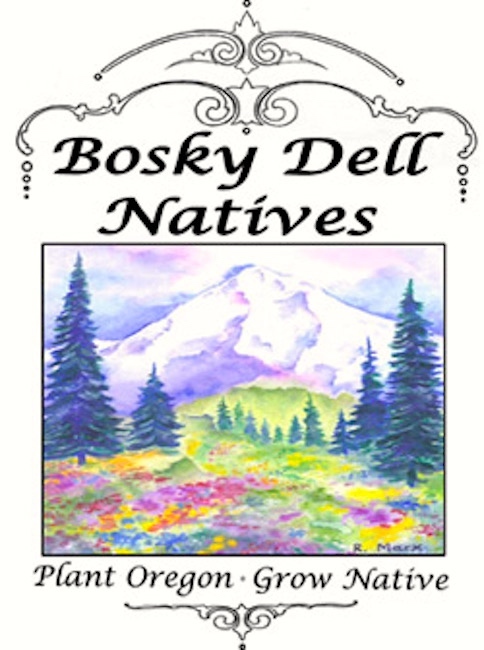 bosky dell. The English noun bosk is obsolete, the adjective bosky distinctly literary in register. The collocation bosky dell has, or at least had, a status as a somewhat formulaic expression, a not very transparent semi-idiom: both of its parts, the adjective bosky and the noun dell ‘valley’, being rare and archaic-sounding lexical items. And every bosky bourn from side to side. From her thatched pallet rouse. Up to the middle of the 19th century, Milton’s original bushy dell predominates heavily. Then it plummets, and bosky dell ascends, until late in the 19th century, when they decline gracefully together towards insignificance. Marmaduke is a 2010 American family comedy film adaptation of Brad Anderson’s comic strip of the same name. … Marmaduke [a Great Dane voiced by Owen Wilson] meets a beautiful Rough Collie named Jezebel (Fergie), whose boyfriend is Bosco (Kiefer Sutherland), a violent Beauceron with two Miniature Pinscher minions named Thunder and Lightning (Damon Wayans, Jr. and Marlon Wayans). Bosco intimidates Marmaduke, who does not want to fight. The Voices is a 2014 black comedy horror film. Directed by Marjane Satrapi and written by Michael R. Perry, the film stars Ryan Reynolds, Gemma Arterton, Anna Kendrick and Jacki Weaver. Jerry (Ryan Reynolds) is an upbeat man who works at a bathtub factory, and lives in a modified apartment above a bowling alley with his dog, Bosco, and his cat, Mr. Whiskers. Jerry is a man with an innocent, almost childlike, demeanor and suffers from delusions and hallucinations that manifest in the form of his pets talking to him. Bosco often represents his good intentions while Mr. Whiskers represents his more violent nature. Though no animal (or human) filled the vacancy, Sunol wasn’t ready to forget their leader — though the town is split on the degree of reverence required. 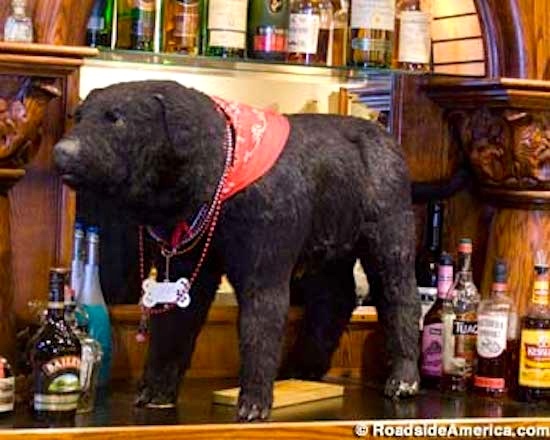 A restaurant calling itself Bosco’s Bones and Brew opened in 1999 featuring a specially engineered, Bosco-like stuffed dead dog behind the bar. The bartender lifts the dog’s left rear leg to draw a pint of beer. Bosco’s Bones & Brew is under new ownership, but the dog is still tapped and sampled daily. 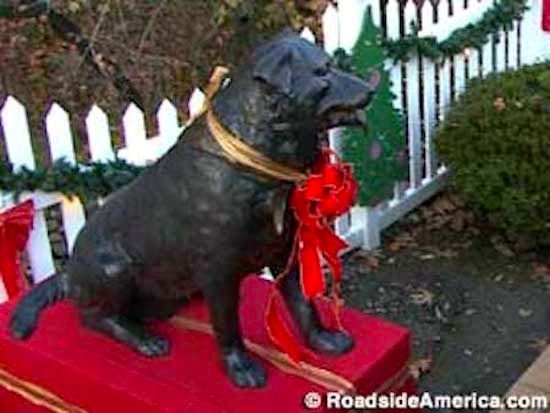 When we visited, bartender Michelle coaxed the dead dog into streaming Michelob Dark. This entry was posted on September 2, 2017 at 1:06 pm and is filed under Formulaic language, Idioms, Movies and tv, Names, Poetry. You can follow any responses to this entry through the RSS 2.0 feed. You can leave a response, or trackback from your own site.